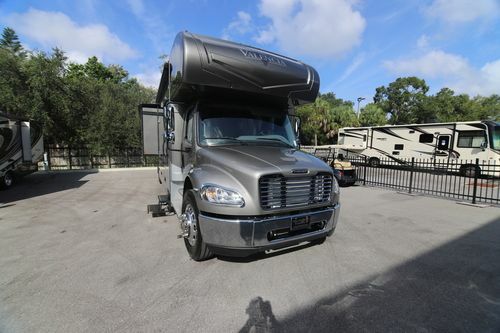 The 2018 Renegade RV Valencia Super C diesel motorhome. Luxury appointments and high quality don't have to come at a high price. The Valencia is Renegade's newest addition, built on the very first Super C Chassis that was designed for a motorhome from the ground up. With comfortable sleeping for up to 9 people, Valencia is a "go anywhere, do anything" product that is incredibly fun to drive, and a blast to use. The kitchen of the Valencia features solid Cherry hardwood cabinets with plenty of storage and soft closing drawers, and topped with LG HiMacs polished solid surface countertops. Standard appliances include a convection microwave, sealed 3-burner recessed cooktop, and a 19 Cubic Foot Whirlpool residential refrigerator with icemaker. Valencia’s contemporary design is comfortable and stylish, featuring warm tones and cool features. The furniture is as modern and sleek as it is comfortable. The unique slide-a-bed sofa converts easily to a queen size bed while the dinette folds into a cozy single sleeper. For extra overnighters, the cabover 60 x80 queen bunk makes a great guest room, complete with its own LED TV (optional) and privacy curtains. 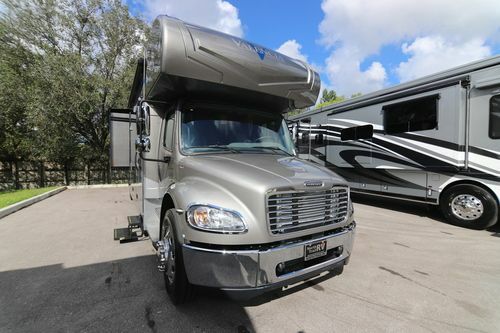 The Valencia rides on the smooth, powerful, and fun-to-drive Freightliner S2RV chassis, the first Super C Chassis specifically designed for a luxury motorhome. The Renegade RV Valencia master bedroom offers great storage, thoughtful design and first class accommodations. With a full rear wardrobe and a large dresser, you’ll have space for all your travel necessities. The convenient bench has a padded seat, flip up lid and a cedar lining. It’s perfect for shoe or linen storage and doubles as a great hamper. Rest and relax on the king size iRelax memory foam mattress. 12,000 lb. of trailer towing capacity behind a fully loaded coach. Solid Cherry hardwood cabinets with solid surface countertops and soft closing drawers. Stainless Steel appliances including an 19 cu. ft. residential refrigerator with icemaker. Air ride driver/passenger seats with adjustable lumbar support and armrests. 100 gallons diesel fuel capacity, single fuel tank fill. 2 spacious floor plans @ 38' overall length. 40" LED TV w/soundba home theater system & Bluray player in living room. 32" LED TV in Bedroom & outside entertainment center. Heavy gauge steel outside compartments, fully lined and much more! 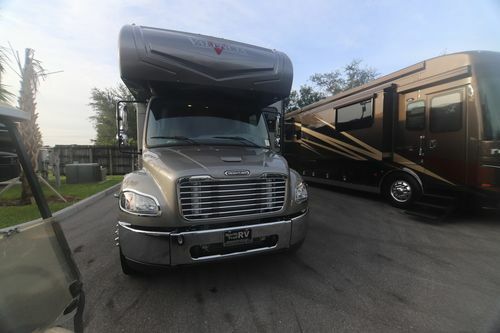 This is a partial list of the The 2018 Renegade RV Valencia Super C diesel motorhome features and options. For a complete and exact list of standard features and options, please call us and ask to speak to a North Trail RV Center RV Sales Consultant. North Trail RV Center is not responsible for any errors or omissions listed here. The Renegade RV Valencia Super C diesel motorhome comes in the following floor plans, 38 BB.